The United States Marshals Service has issued a BOLO Alert (Be On the Look-Out) for Quentin James Kelley. 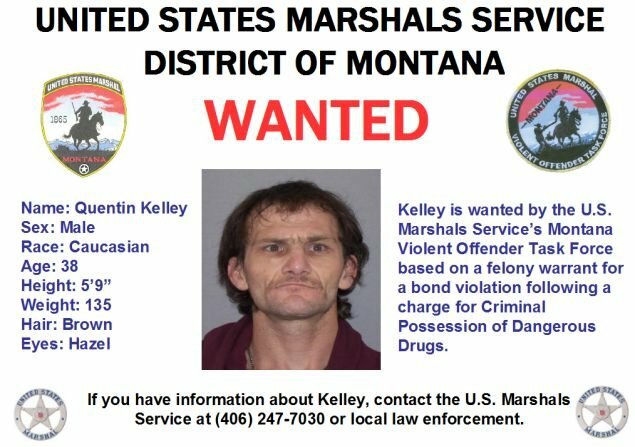 Kelley, 38 years old, is wanted by the U.S. Marshals Montana Violent Offender Task Force based on a felony warrant for a bond violation following his conviction for felony drug possession in Cascade County. Kelley is described 5-feet, 9-inches tall, about 135 pounds, with brown hair and hazel eyes. Anyone with information about Kelley is asked to call the U.S. Marshals Service at 406-247-7030 or their local law enforcement agency.